Reco’s Magic, a comedy short that tells the story of a middle class family that has fallen on hard times and how the enterpreneurial spirit of the children comes to the rescue, will make its festival debut, at the Winter California Women’s Film Festival, January 6 – 8, in Los Angeles. The California Women’s Film Festival is a biannual event (Winter and Summer) that celebrates women filmmakers, artists and writers by providing a showcase and networking forum in the heart of Hollywood. 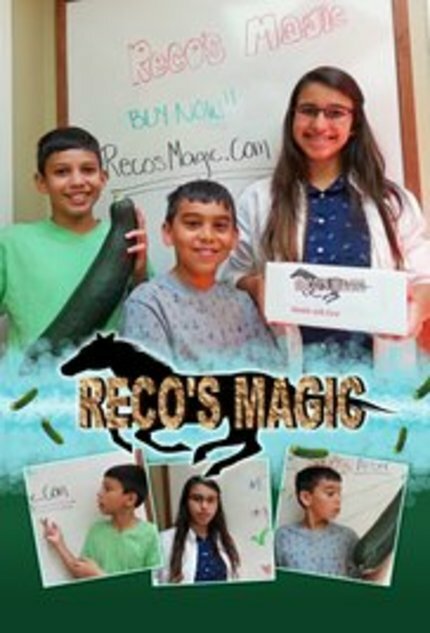 Similar to the films theme, “Reco’s Magic” was a family project, directed by veteran filmmaker Corinne Jayaweera (“The Spirit of Iris”), produced by husband Sorya, and written by their three children: Kaylee-Anna, 17, Everett, 14, and Sorin, 12. Jayaweera’s last documentary short “The Spirit of Iris” recently completed a successful film festival run, and followed the life of Iris Cummings Critchell, a trailblazing woman, who swam in the 1936 Olympic Games in Berlin, and went on to be one of the earliest groups of women to ferry planes for the Air Transport Command in World War II. For the past 70 years, she has continued flying, teaching and inspiring young minds to be prepared for whatever life brings to them. At age 95 years young, Iris still swims daily, maintains a current pilot’s license and instructor rating, and has given many historical presentations about her adventures in aviation. Corinne Jayaweera was born and raised in Southern California where she still resides today. Since childhood, her passion has been fine arts and International Relations. She graduated from the University of Redlands with a double major in Asian Studies and Sociology/ Anthropology with minors in Music and Dance. “CJ” has enjoyed her career in various academic roles, most recently at Claremont Graduate School as an event coordinator for the Mentor Program and Kravis Concept Plan business competition. But her first love of fine arts was still exerting its pull, and she left her stimulating academic career to focus on her fledgling film production and event planning company. She is extremely proud of her growing, multicultural family. Her personal charitable causes include raising funds for cancer research at the City of Hope, ALS research directly with Augie’s Quest, and most recently assisted in the World Games for the Special Olympics. “Reco’s Magic” will screen at 11:30am, Saturday, January 7th at the Acme Theater, 135 North LaBrea, Los Angeles, 90036. Tickets are $13 and can be purchased in advance at http://www.calwomensfest.com/Ticket_and_Schedule.html or at the box office prior to the screening.